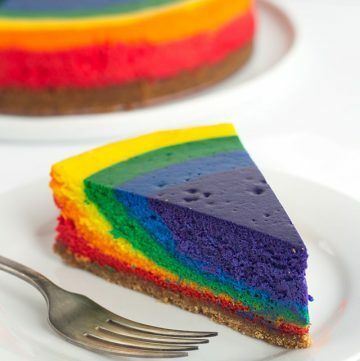 Rainbow Cheesecake is creamy vanilla cheesecake decorated in a fun rainbow of color. It’s the perfect St. Patrick’s Day dessert recipe, or great for a unicorn dessert party! Sadly, I couldn’t find a leprechaun to use in a third recipe. Oh man, that joke was in poor taste. I can remember my first year of blogging, I was quickly educated on the proper way to write St. Paddy’s Day on a buzzfeed roundup I created. The comments were slightly brutal, but I got the point. I had always wrote St. Patty’s Day and so has probably everyone else in the United States. WELL, it’s wrong. I was so proud of my rainbow cheesecake that I cut a couple of slices and took them down to my good friend and her hubby. It was too pretty not to share. She messaged me at like 10 at night to tell me that she had to hide the cheesecake until her kids went to bed. Does anyone else hide treats from their kids? I know I’m so guilty of this. I probably would be more so if I had more than one kid running around. You’ll be happy to know that Lucian has had some of this rainbow cheesecake. I didn’t keep it from him, because it’s too darn pretty. It screams fun and playful. He was so excited to watch me make it and to be able to eat it. I think he told anyone that would listen about the rainbow cheesecake. 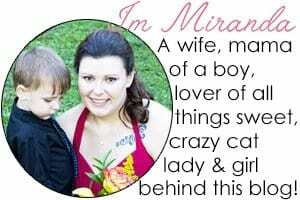 When my five-year-old brags about my creations, I feel like a superhero. It is the best feeling in the entire world. One last thing, you probably noticed the air bubbles in the top and sides. That’s from having to mix the food coloring in thoroughly. All of the extra beating incorporated air pockets. I would recommend tapping the cheesecake. Just be careful not to ruin your beautiful rainbow. Want a couple more St. Patrick’s Day dessert ideas? Bake a Chocolate Whiskey Cake or make some Baileys Coffee Truffles. 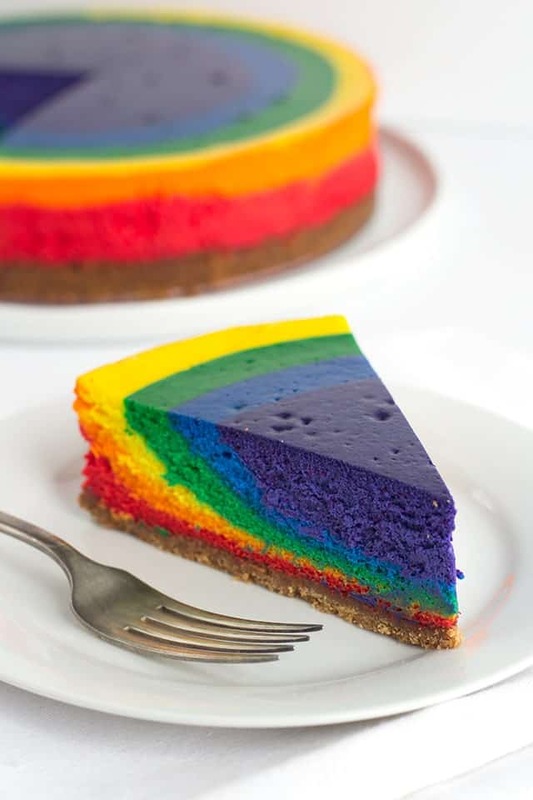 Rainbow Cheesecake is creamy vanilla cheesecake decorated in a fun rainbow of color. It's the perfect St. Patrick's Day dessert recipe, or great for a unicorn party! In a mixing bowl, add in the graham cracker crumbs, sugar, and butter. Stir until the melted butter coats the crumbs. Firmly press the crust into the bottom of a 9.5 inch spring form pan. Place into the oven and bake for 15 minutes. Remove from the oven and let cool. Beat the cream cheese with a hand mixer until smooth. This will help prevent lumps. Add the granulated sugar in with the cream cheese. Beat on medium until combined. Scrape down the sides of the bowl and beat until any lumps of cream cheese are incorporated. Add in the vanilla extract and the eggs one at a time. Mix each egg completely before adding the next and scrape down the bowl after each addition of egg. Add in the sour cream and heavy cream. Mix until incorporated. Scrape down the sides of the bowl and beat any remaining bits. Divide the batter into 6 bowls. I used an ice cream scoop and scooped it out equally. I got 3 scoops for each bowl. Add each gel paste food color into a bowl with batter in it. Thoroughly mix the gel food color into the each bowl of batter. Just before adding the cheesecake mixture, line the outside of the spring form pan with heavy duty tin foil. I double wrap it to prevent the water from leaking in. Starting with the red, add the mixture into the center of the cheesecake. Then add the orange to the center of the cheesecake. Repeat adding the yellow, green, blue, and purple to the center of the cheesecake. Give the cheesecake a few taps to even out the top and remove any air bubbles. Place the spring form pan in a slightly larger baking pan. Fill the outer pan with water. Fill it so it at least goes a quarter of the way up the spring form pan. This will keep the cheesecake from cracking. Place in the oven at 325 degrees and let bake for 1 hour and 20 minutes or until done. To make sure the cheesecake is done, give it a wiggle. If it slightly jiggles in JUST the middle like jello, then it's done. If it jiggles all over, it needs to bake longer. Turn off the heat and crack the oven door slightly. Let it cool in the oven for an hour or two. I kept mine in the oven for about 2 and half hours and then placed it in the fridge. Who’s expecting a huge snow storm today? As of right now they’re calling for 10 – 18 inches in March. Craziness. How do you keep your edges and top bright and vibrant? My outer layers brown and dull in color. I tried reducing baking time but then it is obviously undercooked. Did you put it in a water bath? The water bath helps keep the sides from browning and if I feel the cheesecake is starting to brown on top, I tent it with tin foil to help.